And in those court records, just as in court records everywhere, there is always a story to be told. 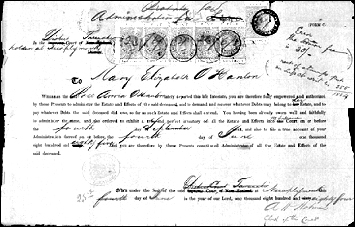 It’s more a matter that she could see it coming — Rose filed for the protective order in January 1882: more than a year before the bankrupcty! (The 1884 date is when her daughter attached it as an exhibit to her filing after Rose’s death.) But yes, Papers Past is a wonderful site (and is cited in the post for the text of the 1860 version of the married woman’s act). What a fascinating story, Judy. Any idea why the laws of New Zealand were so much more advanced than those of the US in their protections of the rights of married women? It isn’t that New Zealand was any more advanced than the US, Doris: parts of the US started passing married women’s property acts as far back as the 1830s.